Partly, it’s because something very similar happened in the 2012 election. The Socialistische Partij (SP, Socialist Party) led polls throughout the summer, only to collapse in late August and early September as voters started paying more attention to the campaign. The party’s leader, Emile Roemer, struggled in a series of debates to defend his extreme views on the European Union and economic policy, and doubtful voters shifted en masse to the more centrist Labour instead. The Socialists, still under Roemer’s leadership, aren’t doing much better in 2017, by the way (though polls suggest they will win between 12 and 16 seats). Wilders suffered the same fate as voters began to take the election campaign seriously. Under the pressure of leading polls for so long, higher scrutiny followed Wilders’s higher profile. For example, Arjen Lubach (the Dutch version of Jon Oliver) skewered the VVD’s lack of policy specifics in a withering 20-minute takedown. Even Wilders’s own brother, in a jaw-dropping interview with Der Spiegel, admits that he doesn’t think highly of the PVV’s brand of extreme politics. There’s only so much room for discontent in a country that is one of the world’s most peaceful and prosperous. On just about every conceivable metric, the Dutch electorate is one of the wealthiest, happiest and safest on the globe. Just to take one measure, the country’s GDP per capita (on a PPP basis) outranks every other country in Europe — except Luxembourg (a banking haven), Norway (oil-rich), Ireland (a tax haven) and Switzerland (another banking haven). Even the poorest parts of the country still feel quite affluent, in no small part to a generous social welfare safety net. Wilders can rage all he wants about ‘Nexit,’ but there’s no appetite in The Netherlands to leave the European Union or even the eurozone. Meanwhile, Rutte has co-opted some of Wilders’s tough talk on immigration throughout the campaign. 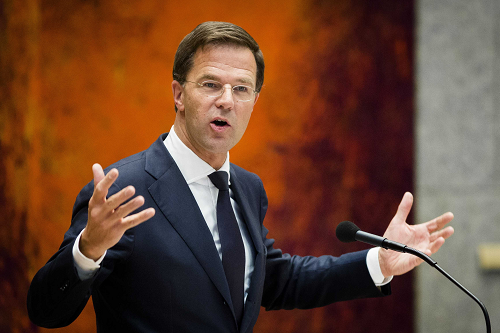 In January, Rutte proclaimed that immigrants should either ‘be normal’ or go away. It’s not like Rutte is going around referring to ‘Moroccan scum’ (as Wilders does) or is even calling for veil bans (as German chancellor Angela Merkel suggested in December). But it was a sharp shift in focus for Rutte, who comes from the more moderate and socially liberal wing of the VVD, to start scolding immigrants who ‘reject [Dutch] values.’ Pechtold, in particular, has reserved some of his harshest criticism for Rutte’s rhetoric on migration. Meanwhile, the spat with Erdoğan in the final days of the election, might also be having a rally-around-the-prime-minister effect across The Netherlands. As Erdoğan makes increasingly unhinged challenges about Dutch ‘fascism’ and ‘nazism,’ Dutch voters could rally to Rutte at Wilders’s expense. Even as Wilders argues that ongoing protests prove that Turkish immigrants should ‘go home,’ and tensions rise over Turkish immigrants, the focus on immigration could ironically prove a net loss for Wilders.